It’s likely that in many writing workshop classrooms, the year is launching with narrative writing. Coming just around the bend, perhaps very soon for teachers who began the school year in early August, is expository writing. The first expository unit may come in the form of any one of a multitude of types of essay units, or perhaps, in the form of information writing. With the Common Core Standards’ emphasis on information writing, this genre has finally gotten its place in the sun. When launching an information writing unit, we can ask students what they know about this kind of writing. If they’ve had some experience with it, they will likely name text features as one of its hallmarks. Certainly, text features are one of the most enticing features of information writing for many young writers.” You mean we get to draw pictures? Or do google image searches?” they say. Finding images that go with what one has written is one way to approach text features. This is appropriate when a student is just learning about this genre. But sophisticated information writers know that text features aren’t just pictures plopped on a page. Text features have a job to do. They are there to teach information that cannot be conveyed in the text, and they are there to help underscore the ideas and information that the writer really wants to highlight. It is this second purpose of text features that can and should inform the teaching of text features in a unit of study for more experienced information writers. One of the first things that happened after the massacre was that Patriots, like Paul Revere, wanted to convince people that the British soldiers were at fault. There was lots of propaganda being published that was trying to convince people that the soldiers killed people on purpose. For example, Paul Revere did an etching that showed soldiers shooting right at innocent people. He did this to make people angry enough to want to fight the British. A teacher using this text to demonstrate ways information authors use text features to highlight ideas could first list some of the ideas that could be popped out in this section of writing. Is the most important idea that people were getting angry at the British? Or that Paul Revere was an active Patriot? Or that propaganda was used to convinced the colonists to fight? Then, the teacher could demonstrate how she chose one idea (in this case, the final one in the list), and used text features to highlight that idea for readers. 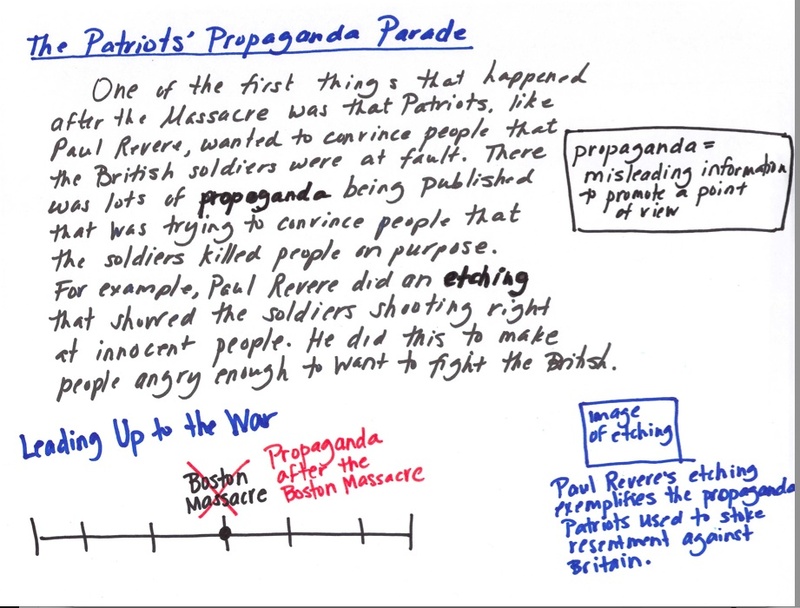 She could show students how she added a definition off to the side with a term to which she wanted to draw readers’ attention (propaganda), and how she used a timeline to convey an idea about the importance of propaganda. She could point out that she didn’t just choose any old image to plop on the page, like an image of the shooting at the Boston Massacre, but instead chose an image that fit with the idea she really wanted to convey. For more on using text features to convey importance and further ideas, see Bringing History to Life, in the 4th Grade Units of Study for Opinion, Information, and Narrative Writing by Lucy Calkins and colleagues. ← Okay, But What Would You Do? 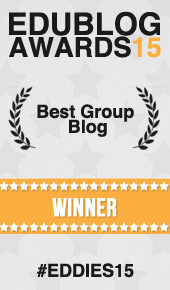 Holding on to this for my next writing unit! Coming up soon. Thanks for being there before I get there! Thanks! I’m always thinking about information writing, I admit! This is just what I need to be thinking about for writing in social studies, Anna. Thank you! Oh good! Who says social studies writing has to be boring? Not us! Love this, Anna. I love raising the bar for kids – having them think about the purpose behind choosing a particular text feature. I can’t wait to do this with kids! Thanks. Oh good! Can’t wait to hear how it goes. Thanks Dana! Love this. I often see text features done in a way that means nothing to students. They can name them, but can’t identify why an author used that feature. Oh yes, and I like your point about doing this in writing helping them think more deeply about text features while reading. This is for the 4th grade? I’m pretty sure when I was in the 4th grade I wrote a report using stamps rather than a computer/typewriter. I definitely wasn’t comparing expository writing with narrative writing. I’d say upper grades, 4 and up could think about this. First it’s important that kids have some experience with information writing. If they are new to the genre, just considering images to go with their writing is probably enough. This could be the next step. I agree, reports sure have changed! Lesson planning has become so iterative. Planning for now (today) and yet also thinking ahead to the next content and what went well last year, dreams for improvement, and checking notes about possible changes mean that a lot of thought IN ADVANCE will help determine the instructional path. I am going to be thinking about your inquiry suggestion myself . . . Thanks Fran! I agree, raising the bar requires plenty of reflection. Thought it can be hard to find the time to look ahead, the reward is huge! This is so helpful for thinking ahead. Usually units sneak up on me and I’m left scrambling, but now my gears are already turning. Thanks for the great ideas! So true about units sneaking up. Same with me! Thanks Beth.